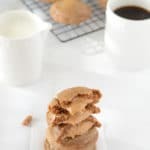 Peanut butter cookies without shortening and using only your food processor, how easy does that sound?. 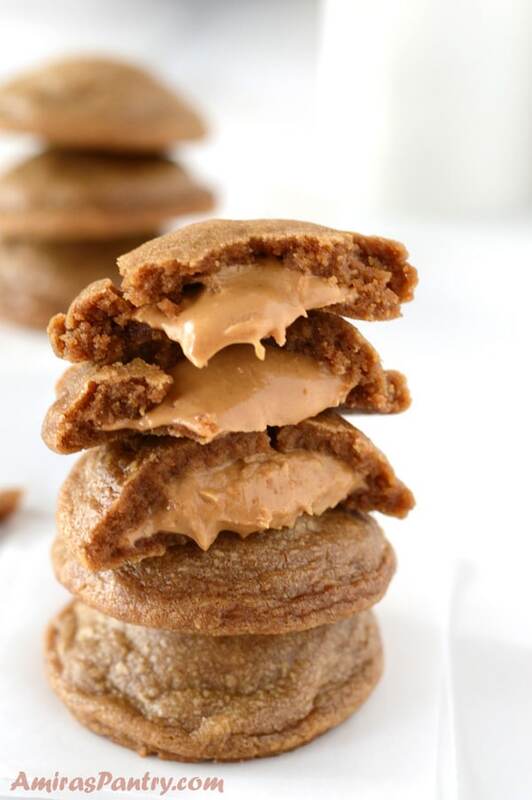 A dangerous biscoff based cookies with peanut butter oozing happily. 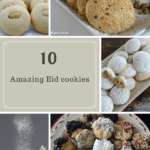 Soft, chewy and exploding with peanut butter kind of cookies. Guys, these stayed soft longer than any other cookies I’ve ever made. 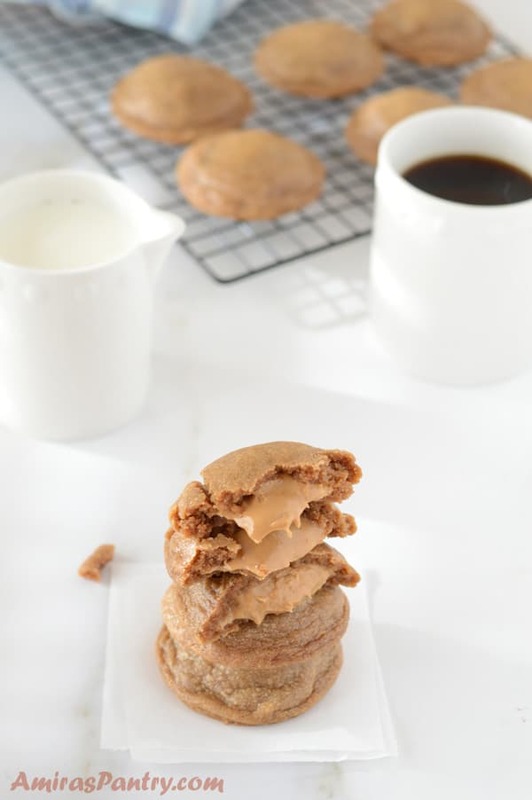 A cookie that combines both the warmth and lightly spiced biscoff cookies along with the creaminess, sweetness and nutty flavor of peanut butter. And let’s not forget how easy it is to make them, no special skills required. The only bugging part is that you need to freeze some peanut butter balls overnight, but the rest of chilling is up to you, not mandatory. 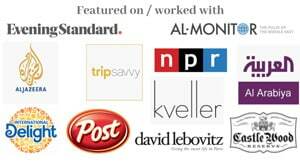 My relationship with peanut butter started off on the wrong foot. Almost 17 years ago, one of my friends told me about a peanut butter jar that her in laws brought from the United States. She kept saying it tastes amazing and her one year old is crazy about. Please note that at this time, peanut butter was not something common in Egypt. Me and my hubby, a newly-wed couple, decided to party for the new year. This new year eve was really special around the world as it was the beginning of the year 2000. Hearing so much about that amazing creamy jar, we headed to a famous store in Egypt which sells,mostly, imported stuff. I bought stuff for our little party and guess what? bought a big jar of Jeff along to try it. I stood there in my kitchen wondering what to do with it樂?. Called my friend and she said, you can just scoop it up or add it to some jam. I tried everything she said, but neither me nor my husband liked it. I tried it with jam, honey, plain and even cheese  but nothing worked! That jar ended up in my friend’s kitchen the next day with me telling her, I will never buy that thing again…. was I wrong? what do you think? We’ll start the night before by scooping 16 Tablespoons of your favorite peanut butter and freezing them. 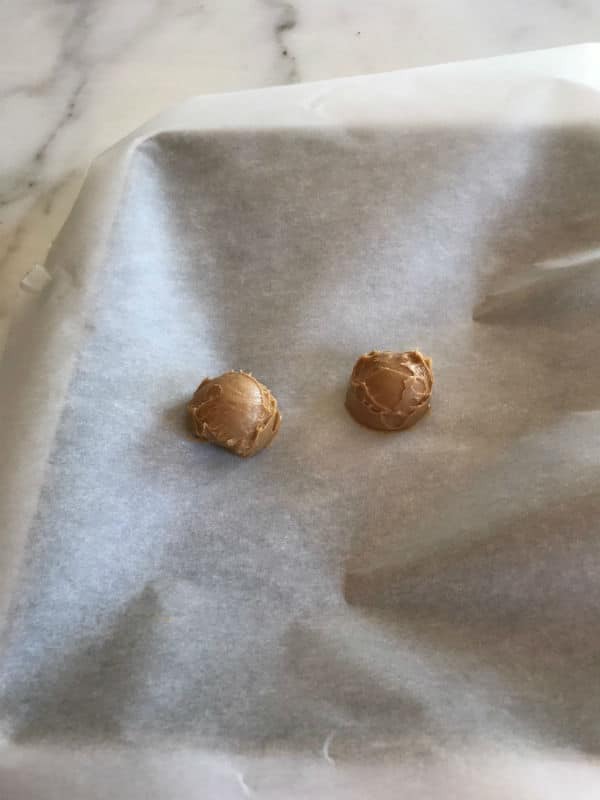 This is the part that I find annoying about the recipe, remembering to put the peanut butter balls in the freezer is not easy for me 🙂 I had to set a couple of alarms for that. 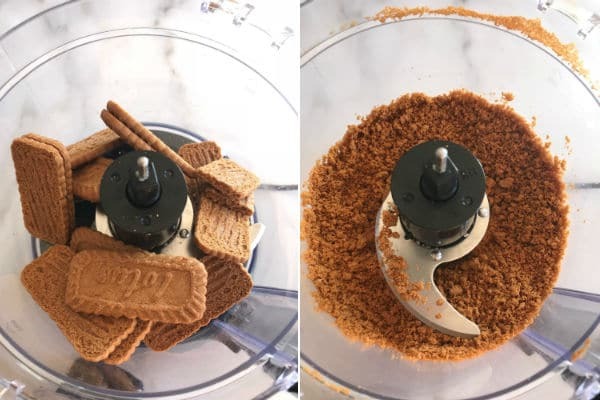 Now process Biscoff or lotus cookies in your food processor until fine crumbs form. Then add the dry ingredients flour,cinnamon, salt, baking soda and give them all a quick round in the food processor. Add room temperature butter and peanut butter then combine well. Add sugar, egg and vanilla extract and process. You’ll have a nice consistent dough just make sure that everything is well combine. 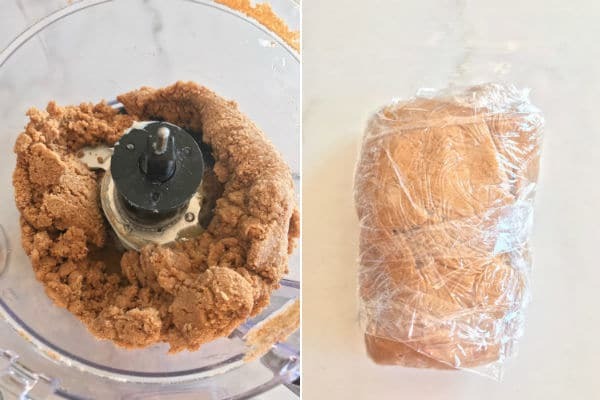 Remove the dough from the food processor and wrap in plastic wrap. Refrigerate for 30 minutes until you heat up your oven. 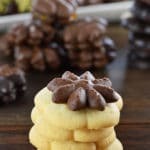 If you have time , and patience, refrigerate for a couple of hours or even overnight, that is if you want a high tall cookies. If you bake instantly, your cookies will be more flat, which is still good and tastes incredible. But, I like my cookies thick and high so I did actually refrigerate them for 2 hours. You can also keep the dough refrigerated for up to 5 days, which makes it a very good make ahead kind of recipe. 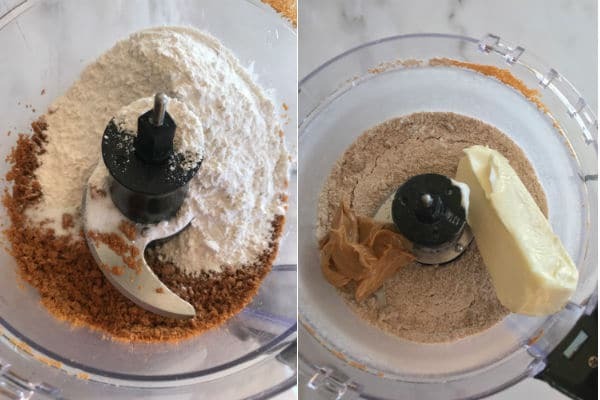 Now scoop up 2 Tablespoons of the dough, make indentation in the middle and place a frozen peanut butter ball in the middle. 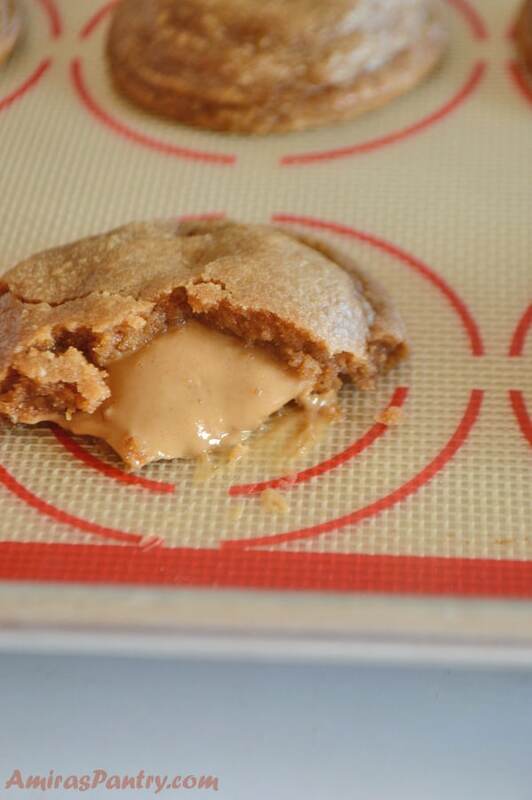 Roll the dough over to cover the peanut butter and place on a cold cookie sheet. If you are using one cookie sheet and you’ll work on batches, remember to cool the sheet in between. See tips on spreading cookies here. Now bake and enjoy. What motivated me to make these cookies in the first place is my little guy. One day my husband brought us some cookies from a bakery near his work and they were so delicious. One of the cookies was just peanut butter sandwiched between two cookies that tasted so much like Biscoff. It was amazing and my kids, especially my little one, loved this a lot so I decided to give it a try. 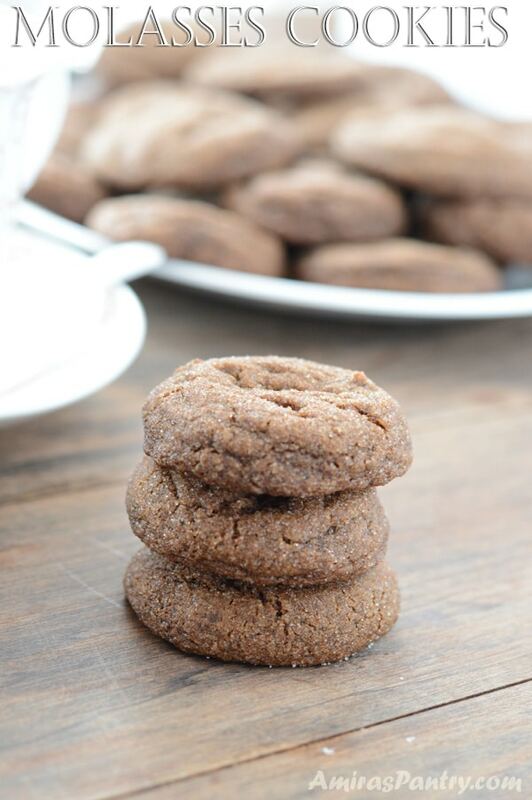 An easy peanut butter cookies without shortening made in your food processor. 1/2 a packet 8.8oz biscoff/lotus cookies. about 17 cookie. In the food processor, process the Bischoff cookies to fine crumbs. Add cinnamon, baking soda, salt and flour then process again for 15 seconds to combine. Add softened butter and peanut butter then process to combine. Preheat oven to 350F. Adjust oven rack to be in the middle. 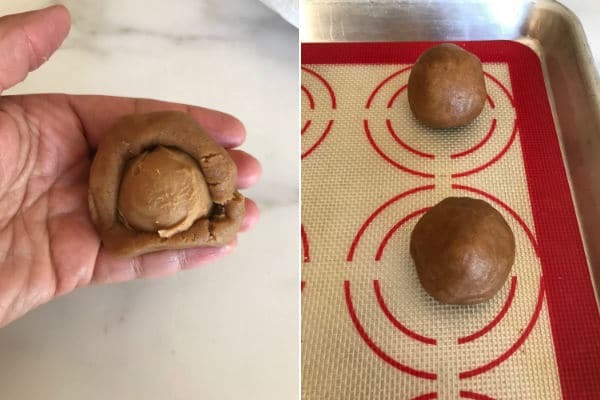 Now take 2 Tablespoons of the dough, form into a ball, make an indentation with your thumb in the middle and place one frozen peanut butter ball in. Close the cookies making a ball and place in a baking sheet lined with parchment paper or baking mat. Work in batches while keeping peanut butter balls in the freezer especially if your kitchen is hot. Transfer to an air tight container. 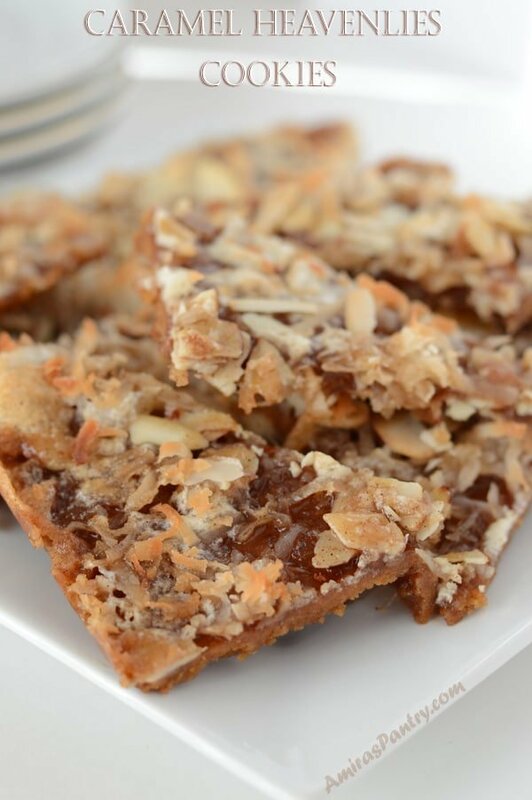 * Be sure to place the peanut butter on a parchment paper for easy peeling afterwards. ** Make sure to scrape the sides of the food processor to make sure that all the ingredients are well combined. 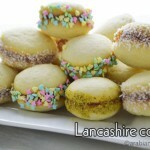 *** For a taller thicker cookie refrigerate for a couple of hours or even overnight if you have time. This can stay fresh in the fridge for up to 5 days. **** Cookies will look undone and very soft, do not attempt to take them out of the baking sheet right after taking them out of the oven. Wait for 10 minutes until they are completely cooled and they will harden by then.